Jessica has also generously let me include some of my very favorite recipes from the book for you try at home (copied as is, right out of the book)…hooray! Treat your tired feet with this tingly home spa cocktail. Astringent witch hazel helps relieve swelling, while the lime and grapefruit juices soften calluses. Mint refreshes and soothes, and the bubbly water re-mineralizes and relaxes. What you will need: washtub, cutting board, wooden spoon, measuring cups, mixing bowl, fork. Note: if you don’t have a washtub, you can use a soup pot, shallow bowl, or plastic storage tub. As long as you can soak your feet inside without spilling, it should work! To Make: Start with room temperature rather than refrigerated ingredients. Put the witch hazel, lime juice, grapefruit juice, and lime rings into the washtub. Muddle the mint leaves by crushing them with the back of a wooden spoon, coarsely chop them, put them in the washtub, and give it a mix. In the mixing bowl, place the salts and coconut cream. Stir to blend to a uniform consistency. Bring the washtub and the bowl of scrub to the place where you will have your foot spa. Set up you foot spa area with anything you will want for a super comfy-cozy relaxing experience. Light a candle, gather a magazine, or maybe an eye pillow, and enjoy a cup of tea. Play some relaxing music. Since the foot bath will not be warm, you may want a blanket, heating pad, and some pillows so you’re sitting as comfortably as possible. Gather a towel to dry off after the foot bath. And you’re ready to get started! To Store: This recipe should be made fresh before each use. To Use: Pour the mineral water into the washtub and stir. Settle in and soak your feet for 10-20 minutes. When you’re ready, use the coconut cream and salt mix to scrub the built up dead skin and softened callouses off your toes and feet. Dry off with a towel. Rinse off your feet in the tub or shower if desired. Note: Get the most out of this foot spa treatment by trimming your toenails right before putting your feet to soak in the Fizzy Mojito Foot Spa. After the soak and scrub, use the tip of a nail file to scrape the softened buildup from under your nails. 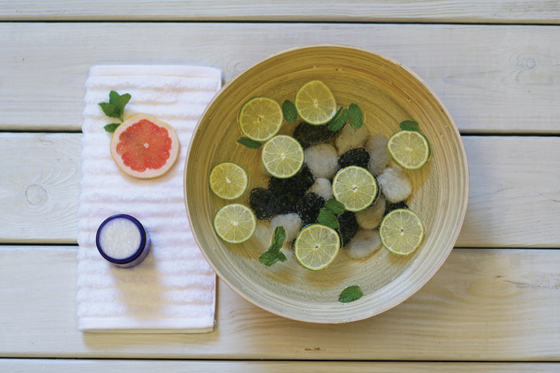 Go green with the avocado and spirulina found in this recipe and your skin will glow from the life-giving vitamins, emollients and vital antioxidants in this super-nutrient-charged facial mask. Avocado is hydrating, nourishing, and regenerative, and every molecule in spirulina is skin-food for a pure, natural healthy glow. 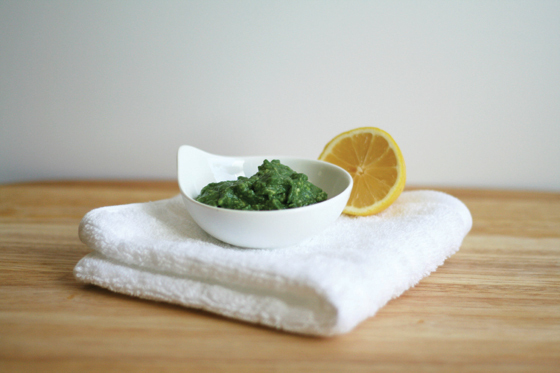 This easy-to-make superfood moisturizing facial mask is beneficial for all skin types, especially dull, dry and sensitive. To Make: Scoop the avocado out of it’s shell and place into your mixing bowl. Add the lemon juice, spirulina, and olive oil. Mash the ingredients together with the back of your fork until you have a smooth, even consistency. To Store: This mask should not be stored. Use immediately. To Use: To use, spread a medium-thick layer of the mask onto clean skin. Leave on skin 10-20 minutes and rinse off with warm water. Follow with toner and moisturizer. 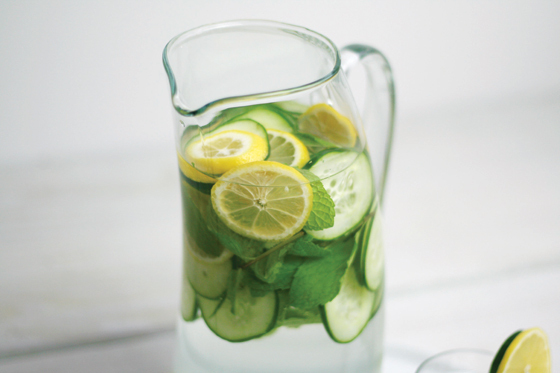 Get rid of extra water weight while staying hydrated with this deliciously quenching spa water. Cucumber and lemon are natural diuretics that aid digestion and appetite control. The ginger and spearmint help relieve bloating and will also benefit the digestive system. This delicious, refreshing, and detoxifying drink is beneficial for weight loss and for relieving PMS symptoms. To Make: Mix all the ingredients together in a large pitcher. Refrigerate for several hours or overnight to allow the flavors to infuse the water. Strain and serve over ice, if desired. Garnish with a slice of cucumber or lemon. To Store: Keep refrigerated and drink within 4 days. To Use: You can drink this spa water all day long! Drink this for up to four days in a row and you will start feeling great, The extra fluids and diuretics are flushing out the toxins while you are also flooding your system with Vitamin C, antioxidants, and digestive aids. You are cleaning out your cells and staying hydrated, which will show in the radiance, tone, and texture of your skin. Excerpted from 100 Organic Skincare Recipes Copyright © 2014 by Jessica Ress, founder of Angel Face Botanicals and published by F+W Media, Inc. Used by permission of the publisher. All rights reserved. Photos courtesy of Jessica Ress, Diane Harrison, and Adams Media. I’d like to try to make face scrubs. I want to learn how to make bar soap! It is one of the few items I still buy. This book sounds like a ton of fun. The perfect gift for a Sunday at-home spa kind of girl! I love the mojito foot soak, especially if I accompanied it with a mojito for me. Hahaha totally. No matter how food the soak, my mouth will always enjoy it more than my feet! This book sounds amazing! I’ve been loving the Angel Face Botanicals Facial Toner I received a while ago. I’m not much of a DIY-er but I’m so interested in learning to make more at-home remedies, especially a good body/foot scrub! I’d like to try the spa water. It is soooo good- there’s other recipes in there too for infused waters for more beautious skin!! I’d love to learn how to make moisturizers and body scrubs. The recipes for the scrubs are super awesome, this book has everything!